After many years photographing events and fun parties we have finally added a photobooth package! 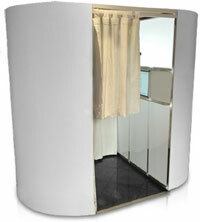 The photobooth is a high quality premium white gloss curved booth. This modern and stylish booth really looks the part and will add an extra dimension to your wedding or event. What’s included in the photobooth hire? The photobooth will be delivered, set up and operated by our trained staff who will take it away at the end of your event. During operation, your guests will have access to a range of fun props and accessories and will get an instant print to take away as a reminder of your event. The prints can be customised with your names, the date, the event name or a company logo. We can also add branding and theming to the outside of the booth to make sure it fits in with your event colour scheme or theme. What are the photobooth hire prices? For full details on photobooth hire prices, please visit the photobooth hire prices page on our sister site – Jackstar Photobooth. As with all our services we are happy to create personalised packages to meet the specific requirements of your event. Please contact us today to discuss your needs further.